VITE is pronounced [veet], like the word "meet" but with the letter V. In French, the word VITE means "quick". The idea behind our original product Vite Hydration was to be able to quickly hydrate and replenish your body during endurance activities. Why do Vite products come in a powder form? The simple reason is that it is the ideal way to not have to add anything artificial. Read more about this subject in our blog post <click here>. In powder form, Vite Charge, Vite Hydration, and Vite Restore have a shelf life of two years when stored in a cool, dry place. Once mixed with a liquid (water, milk, etc) than it should be consumed within approximately 24 hours. Read more about this subject in our blog post <click here>. How many calories should I be eating on the bike? We recommend to target between 300-500 calories per hour based off intensity. Dehydration and electrolyte imbalances for many can be a key contributor to cramping. However, in most cases cramping is related to muscular and nervous system fatigue. 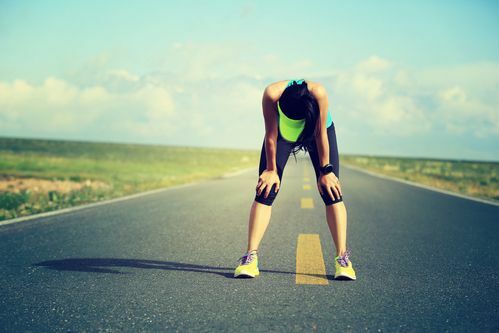 The best way to prevent cramping is by making sure you have proper training, heat acclimation, nutrition, and rest coming into a long event especially in hotter climates. So regardless of your hydration and nutrition strategy, anytime the body is pushed past what it's accustomed to, muscle fatigue will set in often in the form of cramping. Why is Vite Charge only available in Single Serve? Vite Charge is a super high sodium solution to be used when you are unable to replace all the fluid and sodium you are losing through sweat. One single serve contains over 1600mg of sodium. That is why it is recommended to be used only by athletes who participate in long and highly intense activity in hot conditions. This is NOT recommended for athletes just doing an easy one hour workout for example. Therefore, it is specifically designed to provide what your body needs in a single serve dosage. Why do you use Sodium Citrate? Salt comes in many forms and you will hear people talk about sea salt, lite salt, table salt, sodium bicarbonate, sodium carbonate, sodium citrate, etc. Some of them are actually the same thing and others are different. But at the end, the only sodium proven to increase the absorption of fluid when combined with glucose is Sodium Citrate. So from an endurance performance perspective, your sports drink must have Sodium Citrate as the ONLY source of sodium. Otherwise, your body will (1) not be able to absorb all of it or (2) your body will not be able to process it quick enough. Why do I have Sweaty Salt Stains on my Bibs and Jersey? 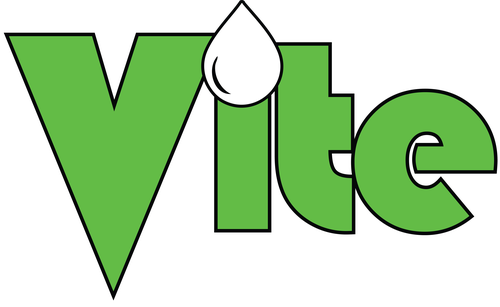 VITE was created to provide hydration and not just carbohydrates. We believe athletes should be getting the majority of their calories and carbohydrates from real food. Our products are a 4% solution (4g carbs per 100ml) with an low osmolality. This ratio of sugars and sodium is specifically designed to push as much fluid into the blood and as quickly as possible. The goal is maxium fluid absorption which mean quick (VITE) hydration and not fueling your body with too many carbohydrates. For electrolytes we only use citrate based products. For example, the sodium is a citrate and can be processed by your body in larger doses without GI distress. For flavoring we only use organic fruit powder. That is why you will sometimes find "floating stuff" in our products. We do NOT use any maltodextrin, fructose, or artificial sweetners which can cause GI distress. Some people believe that sugar is not good for us and are always looking for sugar free products. But as an athlete, sugar is a critical ingredient for performance. Like anything else, the key is not to over do it. When an athlete is training, a small amount of sugar is one of the most important ingredients that you should be consuming. The calories you get from sugar are vital for maintaining blood glucose levels and performance. In addition, to be able to quickly absorb water in the small intestine, you must have the right ratio of sugar and sodium. Sugar free products are fine when you are not training, but when training intensity is high and you are sweating, the right amount of sugar will drastically improve your performance. Honestly, it is not necessary to use our product if you are not sweating. After all it is a sports drink and should be used to replenish both the water and the electrolytes you’re losing. The best way to do this is to use a drink that contains some sugar and sodium. Why can't I just drink water for hydration? You can definitely drink water, everyone is doing it. All joking aside, water is great for short training sessions with low to moderate temperatures and where you are not sweating that much. But keep in mind that your sweat isn’t just water, it also has electrolytes (especially sodium). So if you’re only drinking water, you’re not replenishing your body with everything you lost while sweating. When it is hot outside and/or during longer training sessions (moderate to heavy sweating) there is no situation where drinking just water is better than a drink that contains the right ratio of sodium and sugar. When we sweat we lose water and electrolytes. Sodium is a vital ingredient to the proper function of your body. When our body's sodium levels get too low, hyponatremia can occur. Some of the side affects that occur during hyponatremia are a drop in performance, cramping, muscle spasms, headaches, nausea, and seizures. So as you can see, the worst things you can do and most easiest ways to drop our sodium levels is to drink plain water when we are sweating heavily during training. Drinking just water will dilute the blood because sodium is already lost while you sweat and you will see a drop in performance. Do you know how much sodium is lost while sweating? It varies for each individual and there are tests that can be done to find the exact sweat rate for yourself. However, it is clear that sweat contains a lot of sodium, (200-400mg per 16oz). So using a drink that doesn't contain sodium (like water) while the body is losing sodium can be very dangerous. Therefore, a drink with a sodium content similar to what you lose in sweat along with sugar will help move water in your intestines and maintain blood sugar levels. REMEMBER - You have to replenish everything that you lose when sweating, not just the water. Why is there not a noticeable color when you mix Vite with water? The Lemon Lime flavor does not really change the color of water. If you want a little bit of color, the Strawberry flavor becomes a more pink color when mixed with water. But the main reason you do not see a bright color, is because we use real fruit for flavor instead of chemicals that taste like fruit. And we don't use any artificial coloring or flavors. Think about it, if you were to squeeze a lemon or lime into a cup of water it will not turn bright yellow. It will just make the water not as clear, which is what you find with Vite. With the Strawberry flavor however you have a pink color which is the same if you were to smash up some strawberries and put it in water. When you look at sports drinks on the shelf at your grocery store, those colors are not coming from all natural ingredients. They have included articicial colors to make them look that way. At Vite, we don't want to see a bright blue or yellow drink just because in our brain we associate the outside color of a fruit with a flavor. We believe that our products should be ALL NATURAL. Why put those wasted ingredients in your body especially when you are training and asking your body to perform at a high level. I lost my scoop, what do I do? If you happen to lose the scoop that came in the bag, don't worry. When weighing our product in grams, 1 scoop of Vite is equivalent to 1 tbsp. So just use one tablespoon per 8oz of water. I only have two water bottles on my bike, how can I have more Vite with me for a long ride? Option 1: Go to the Vite Shop and purchase some single serve. Option 2 : This is a little trick we learned a long time ago. Say you are going on a group ride and you know you will be stopping more or less every hour and will be able to fill up your bottle with water. And on your bike you have for example two 20oz bottles. Before you leave, you fill up one bottle with 2.5 scoops of Vite (normal solution). Your second bottle you fill up with 5 scoops (2x solution). This way you always drink from your first bottle on the ride and you can use your second bottle as a concentrated version. At the first stop, your first bottle will be more or less finished hopefully. Then you can split the concentrated bottle between the two and fill them both up with water. Now you have two fresh bottles ready to go which can last you up to 2 more hours. You can use this same method by even doing a 3x concentrated bottle which will last you even longer. If you have two of the same bottles, some people even put a little mark on the concentrated bottle so they know the difference. Option 3 : This is probably what most people do. Just take a small amount of Vite with you in a small ziploc bag or purchase our single serving bags. Our single serving bags fit perfectly in a jersey pocket which you can use when refilling your bottles whenever you stop for water. Why is there no protein included in VITE HYDRATION? Consuming protein during endurance activities provides no benefit in performance. In fact, most testing and studies shows that it has a direct correlation to GI issues. Read more in our blog post about this subject <click here>. How many ingredients are in Vite RESTORE? Look at the ingredient list of the protein you are currently using. How many ingredients are there? How many of them can you pronounce? Does your current protein use Whey Isolate, Concentrate, or a Blend? Now ask yourself why you take protein powders. Is it for the Protein...or for all those other ingredients? Why do you use Whey Protein Isolate? Simply because it is the highest quality Whey Protein. Most Whey on the market is from Concentrate. Whey Protein Concentrate can vary greatly with anywhere from 25-80% protein, 4-52% lactose, and 1-9% milk fat. Our Whey Protein Isolate is over 90% protein and contains less than 1% of lactose and milk fat. This is especially beneficial for you if you are lactose intolerant and can not digest the lactose in other whey proteins. By mixing it with Almond milk, you can now enjoy a virtually lactose free recovery shake. Read more in our blog post <click here>. What about Branched Chain Amino Acids (BCAA)? BCAA is naturally occuring in the whey protein used for Vite Restore. Amino Acids are the building blocks of protein (think: meat and dairy) and have various functions related to energy production during and after exercise, plus they also help to build lean muscle and speed recovery. Read more in our blog post about this subject and why taking BCAA supplement capsules may not be necessary <click here>.